I love a subscription box! Who doesn’t love receiving a gift in the mail every month that’s full of surprises?! This one was extra special because it was my first ‘mommy’ gift, after announcing our little one on the way! Thank you so much, Ecocentric Mom, for such a fun package! 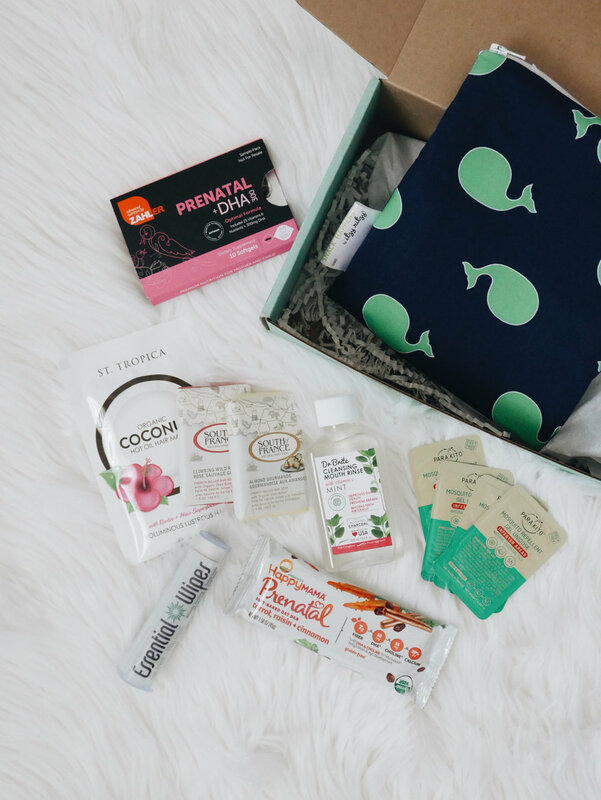 I received the ‘Pregnancy Box‘ and it was so well curated for all of my first time pregnancy needs. They also offer a Mom and Baby Box, as well as a Mom Box. Zahler Prenatal + DHA 300 Vitamins: There were 10 vitamins to try and I was so pleased that they contain everything I was looking for, including Folate- the bioactive + natural form of folic acid! Happymama Prenatal Soft-baked Oat Bar: I have seen these in the store and I’ve wanted to try them. They are gluten-free, have added nutrients and are great for pregnancy + breastfeeding. St. Tropica Organic Hot Oil Hair Mask: So, one of my pregnancy symptoms has been my absolutely awful hair. I can barely do anything with it! It’s been incredibly oily and just barely styleable. I can’t wait to see if this organic coconut mask helps! Dr. Brite Cleansing Mouth Rinse: This rinse has also been on my list of things to try! It contains activated charcoal for cleansing impurities and mint for freshening! I have heard that some women complain of a peculiar taste in their mouth during pregnancy – so this is a great, natural solution for that! South of France French Milled Soaps: These smell amazing and will definitely go in my travel bag this summer. Itzy Ritzy Reuseable Snack Bag: This is an excellent alternative to wasteful plastic bags! Essential Wipes: Naturally sanitizing + chemical free- these are a handbag and diaper bag essential! Para Kito Mosquito Repellent Gel Unidose: This gel lasts for 5 hours and is made from essential oils. Since we had to cancel our babymoon due to Zika invading just about every beachy destination there is- this product is a welcome friend! To order your subscription, follow this link. There are several options for how often you would like to receive your box. Don’t forget to enter code DETOX for a FREE CLEAN BEAUTY GIFT with your purchase!